For many decades there was an ugly, unwritten rule in the National Football League: Blacks couldn’t be quarterbacks. It didn’t matter how great they were in college, or how gaudy their statistics, once they were drafted they would be shifted to other positions, and not even get a chance to play QB. The rare ones who were able to break through like Eldridge Dickey and Marlin Briscoe were either frustrated by their team’s reluctance to offer them the chance to show their skills on a fulltime basis, or converted to other positions (Briscoe became a Pro Bowl caliber receiver). Some players like Gene Washington, who was a quarterback in college, didn’t even bother trying out once in the NFL. They just shifted positions and didn’t even deal with the politics. Others like Joe Gilliam either had brief success, then tragically flamed out, or persevered like James Harris, Warren Moon and Doug Williams. Moon lost seven years of his Hall of Fame career playing in Canada, but eventually became a successful NFL starter. Harris played for the Rams and later the Dolphins, enjoying a good career, but never winning a championship. Williams made the breakthrough with Washington, after establishing his reputation with Tampa Bay. His Super Bowl winning performance forever obliterated the myth a Black QB couldn’t win a championship. Today Black QBs are no longer a rarity, with the likes of Russell Wilson (Super Bowl winner), former league MVP Cam Newton, and rising star Deshaun Watson, as well as Jameis Winston and Tyrod Taylor playing prominent roles for their teams. 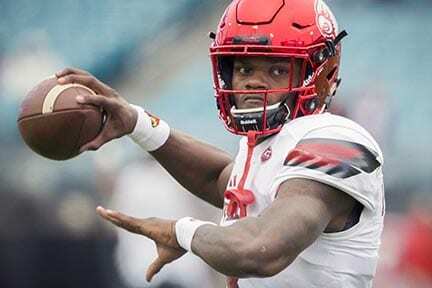 Yet, the current controversy involving former Heisman Trophy winner Louisville QB Lamar Jackson shows there remains around the NFL some vestiges of outdated thinking regarding Blacks at that position. A positive way to view this is that in many cases Black QBs who run spread offenses are such great athletes their multiple skill sets are better utilized at positions like running back or wide receiver that call for a variety of talents as opposed to simply standing back in the pocket and passing. But the negative aspect of that is the implication that these players are unable to master the art of reading sophisticated defenses, calling the right formations and finding receivers, and are too prone to running first and passing second. Ironically, a lack of speed enabled Donovan McNabb for one to avoid any discussion about position shifts. While there’s general agreement that Jackson’s not only a superb athlete but a top team leader, ESPN’s Bill Polian (a Hall of Fame general manager) has already publicly said Jackson’s accuracy on deep throws is suspect, and that he’s also not nearly big enough to make it as a starter. Unlike Wilson, who’s not physically overpowering, Jackson’s not considered elusive enough to avoid getting hurt, nor does he allegedly possess Wilson’s touch as a passer. But there are others like the NFL Network’s Mike Maycock who are big Jackson boosters. “He’s the most electrifying player in this draft, and I think somebody’s going to take him and commit their offensive philosophy to him,” Maycock told USA Today. His comments also get to the heart of a bigger problem: too many NFL teams refusing to adapt their system to the talent instead of the other way around. Given the current size, speed and skill of NFL defensive players, mobility is an even bigger asset than ever. Yes, NFL QBs must be able to read defenses and be accurate on both midrange and long passes, but above all else they have to stay healthy. Not even the greatest offensive lines in the world can protect QBs every single play, as witnessed in the last Super Bowl, which turned on a strip sack on Tom Brady. The bottom line is no one knows for sure whether Jackson can succeed or not as an NFL QB, but he’s earned just as much right to get a legitimate shot as Wyoming’s Josh Allen, USC’s Sam Darnold, UCLA’s Josh Rosen or Oaklahoma’s Baker Mayfield. Let him get drafted, go to camp and rise or fall as a QB based on performance, not misconceptions or stereotypes.